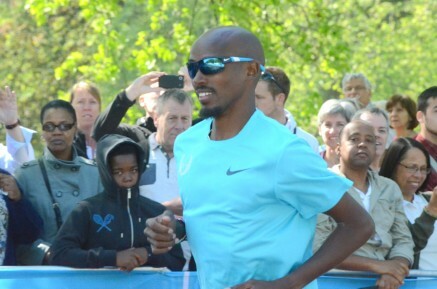 15th September 2013 – The highly anticipated match up between three of the greatest distance runners of all time did not disappoint as Mo Farah (GBR), Haile Gebrselassie (ETH), and Kenenisa Bekele (ETH) went toe to toe at the 2013 Great North Run. In cold, blustery and at times wet conditions the three of them traded the lead throughout the race but were still locked together as they passed the 10 mile mark. Bekele was the first to strike for home as with just over a mile left he tore down the steep incline onto the seafront to establish a gap over his rivals. The change of pace was too much for Gebrselassie and he had soon settled for third. Bekele continued to push and had opened up a 30m gap on Farah with 600m left to run. With 400m to go the gap still looked too big but somehow Farah dug in again and used the track speed which took him to double gold in Moscow last month to move onto the shoulder of Bekele with 70m remaining. It was to be Bekele’s day though and he took the win in 60:09, one second ahead of Farah who clocked 60:10, the fastest half-marathon ever run by a British athlete.